« Oh, rats! We have nutria. Review of: Fields and Streams. Stream restoration, neoliberalism, and the future of environmental science. Rebecca Lave. The University of Georgia Press. 2012. David Rosgen is perhaps the best known practitioner of stream restoration in the United States, and perhaps beyond. His method, Natural Channel Design, is specified in many state and federal agency-funded projects. This method in fact is specified by the Harris County Flood Control District for the Memorial Park Demonstration Project, a “restoration” of an unchannelized segment of Buffalo Bayou on the southern flanks of Memorial Park, in Houston. The interesting thing about the Rosgen system is the amount of controversy it has engendered. This controversy is referred to as the “Rosgen Wars” in Rebecca Lave’s book “Field and Streams”. The Rosgen system is in wide use by consultants and agencies, but many if not most academics are highly critical of the system.They claim that it oversimplifies very complex fluvial systems. Yet it is the very simplicity, Lave suggests, that has made the Rosgen NCD system so popular. 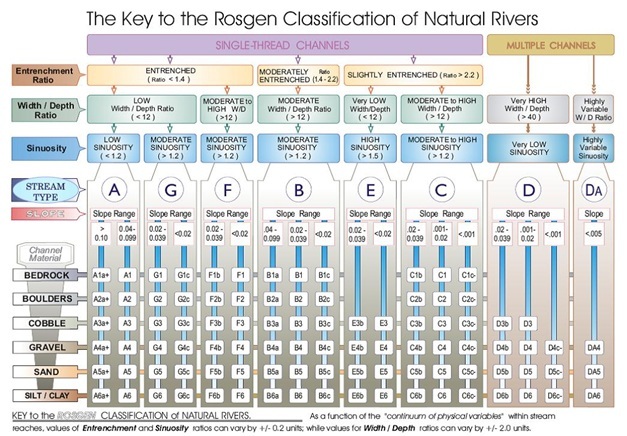 Rosgen developed a classification system (see e.g., graphic above) that is relatively easy to apply. Rosgen now has a Ph.D., but did not while he developed most of the system. It is thus a system developed almost wholly outside of academia, and in response to applied questions, and more particularly in response to market demands. This last is the “neoliberalism” referred in the subtitle of the book. Lave is a social scientist not a fluvial geomorphologist. But she is a social scientist who studies scientists, and she uses the work of Pierre Bourdieu to examine the “political geography” of stream restoration science. Bourdieu is essentially interested in how scientists establish their claims to authoritative truth. The Rosgen wars is very interesting indeed because here we have a maverick on the fringes of academia in a very authoritative position, at least from the perspective of the market and the agencies that require restoration (such as our own HCFCD). And perhaps at least part of the reason for the resistance and rebellion on the academic side. Is this the model for the future of environmental sciences, as the subtitle suggests? Lave points out the NCD has not been definitively proven to work. On the other hand, perhaps it has not been proven to fail (consistently anyway, since there are several reports of failure of NCD projects). I have heard of course of Rosgen. I believe he has been brought to Houston several times. A colleague without formal training in hydrology or geology as far as I know, who took one or more of Rosgen’s short courses, told me he was a “fluvial geomorphologist”. When I asked him what school he went to, he quickly backed off of that claim. That little incident is perhaps indicative of the gulf between applied folks like Rosgen and the academics. After reading this fine book, I am not really swayed one or or the other, more than I was before at least. As an academic, I would probably lean more in that direction. But as an applied academic (working for the Land and Sea Grant programs), I very much appreciate a system designed to be applied easily to the real world. I have to admit I find the term “Natural Channel Design” a bit disconcerting. This system is still about stream stabilization, so in that sense it is not natural at all. I highly recommend this book. The implications go well beyond the Rosgen controversy. They apply anywhere that the market demands authoritative answers, and where practitioners outside of academia, and with little connection to academia, define the science that informs the practice. I am thinking in particular of wetland mitigation banking, but this could also apply to issues on the horizon such as carbon trading and other ecosystem services trading and mitigation. I’ve taken a couple of courses from Mr. Rosgen and found him quite knowledgable. However, while the academic controversy is over his stream classification system, that’s not really the important knowledge he has to convey and is somewhat of a distraction from his message of how to incorporate the study of natural stream systems into the design of man-made drainage conveyances or the restoration of degraded streams. I put now Dr. Rosgen’s course to use when collecting two weeks worth of data on stream cross-sections of the San Jacinto’s west fork in order to desgin a natural stream channel for future sand mining reclamation. Something that was never put to use, but the work we did was sound and enlightening. Dr. Rosgen’s teachings are not something that can be applied without local expertise, knowledge and usually a lot of additional field work. I think much of the controversy stems from the results of when civil engineers misuse Mr. Rosgen’s books and publications to put forward projects without consulting local experts or without capturing the additional field data to produce a design that truly results in an environmental asset.